In the Earth Science program at UVSC, we recognize the tremendous educational and professional benefits students receive from participating in faculty - led research projects. Consequently, we put a great deal of effort into developing projects for students to participate in. I currently have two new projects that are in their early stages. One is a study of land surface deformation that results from three different geologic processes: landslides, tectonic movements related to the Wasatch fault, and variations in groundwater levels. The effort utilizes high-precision GPS surveying techniques. 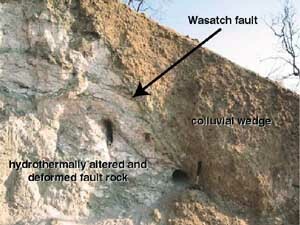 The second project seeks to determine deformation and stress in the rocks adjacent to the Wasatch fault, and how flow of deep groundwater through the deformed rocks along the fault has led to geochemical reactions and alteration of the chemical composition of rocks in and along the Wasatch fault.